Obstacle to Comfort is a 55-minute video on the life of George Muller of Bristol. The man became a legend in his own generation. He was the builder of schools, a supporter of missions and a father to some 10,000 orphans. The amazing issue of his life does not lie in what he did, but in how he accomplished it. He refused to inform anybody concerning his needs, mentioning them only to God, in private, on his knees. It may be difficult to track down. We found ours at our home school assistance program library. Finding it will be well worth the effort. I found one used on http://www.amazon.com/ for $2.99. Huge difference from http://www.half.com/ at over $21. It wasn’t on Netflix. 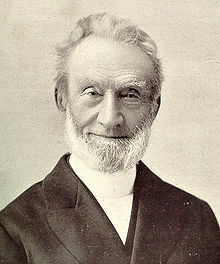 This video was excellent in describing George Mueller’s background, his conversion, the four most influencial people in his life, how he became a man of prayer, why he never wanted a salary, his pioneer work in founding orphanages … all of this and more upon a clear backdrop describing the current events of his day. I especially appreciated hearing statistics relating what happened to the orphans under his care after they grew up. It is hosted by an older gentleman who clearly loves this man who has greatly impacted his life and ministry. His hands tremble, so he moves them a lot, but I didn’t find it too distracting. On the contrary, I was touched that he was determined to make the film regardless of physical issues. Not terrible for a low budget 15 year old film, but it is slow compared to modern flashy media. Not a big deal. This story is a testament to God’s grace before salvation, at salvation, and beyond. There is no possible way that all the answers to prayers and amazing provision were merely coincidence. Clearly God worked in and through this humble man. I learned that during the blitz of WWII, when Hitler caused numerous deadly attacks on London, many bombs fell around the Mueller campus. And people would run to the buildings of Mr. Mueller’s orphanage instead of to storm shelters. When asked why they would take that risk, they replied, “We know God is here.” None of the orphan houses, schools or offices were ever harmed. This true story of faith was illuminated by numerous photos and location visits. I was moved by seeing faces of the children he helped, the orphanages and schools built through prayer, and photos of the man himself. Dr. Connolly takes viewers to visit a man still connected to the Mueller organization, who lovingly untucks Pastor Mueller’s personal record books from a safe, showing us his very first book, introducing us to his first orphan. First of thousands.